Natural stone steps are a great addition to any landscape, yard, or garden. 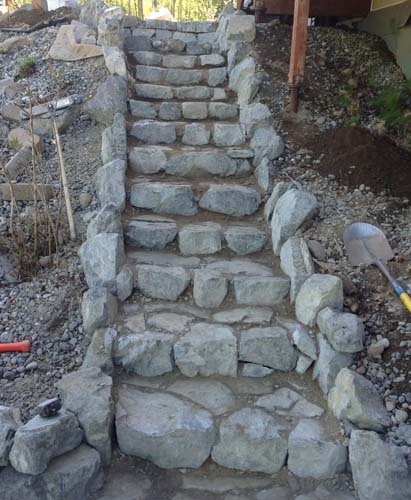 The rugged Alaskan landscape around Anchorage provides ample opportunities for landscaping steps. Natural hills and valleys often require access from the top of a driveway to the bottom portion of a front or backyard, for example, and a natural stone stairway provides a beautiful, long-lasting solution. Rock Landscaping specializes in the use of natural stone, often taken directly from the surrounding area. We believe that nature is best when building retaining walls and steps because only nature can withstand the elements for generations. Here are some examples of recent stone stairway projects we have performed in and around Anchorage, Eagle River and Wasilla.